Specific content knowledge will vary according to the game students play and the connection to school-day learning and the state standards. A major goal for students in the elementary grades is to develop an understanding of the properties of and the relationships among numbers. One of the very effective ways teachers can reinforce the development and practice of number concepts, logical reasoning, and mathematical communication is by using math games. Games are great for targeted practice on whatever standard the children need to meet. At all my teacher trainings, I begin by giving the teachers a quiz using a ditto with many three-digit addition problems. 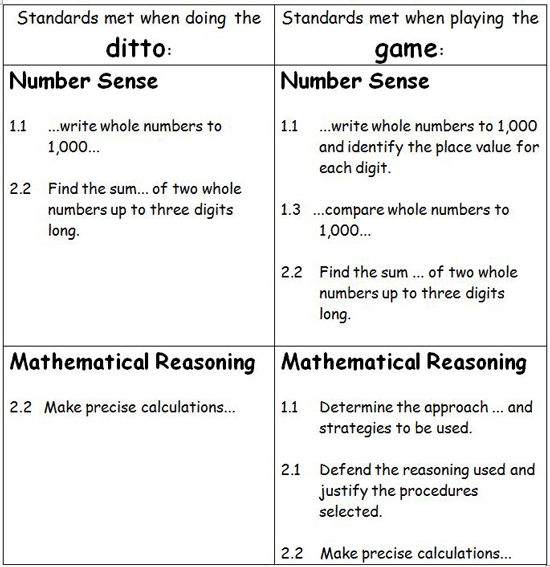 We then proceed to look at the mathematics standards, and the teachers decide which standards (or parts of each standard) were met by doing the ditto. As you can see, not only did we meet more standards by playing the game, but many of the standards were met more fully! Many teachers are surprised at this result, but once they begin to use games in their classrooms to help their students learn and reinforce math skills, they are convinced. Many people (teachers, administrators, and parents) think of games as being “fluff” – only to be used when recess has to be indoors, or for use the last 10 minutes in class on Fridays, or, occasionally, for small group center work. Once teachers begin to watch what happens as students play games, they almost always change their minds.